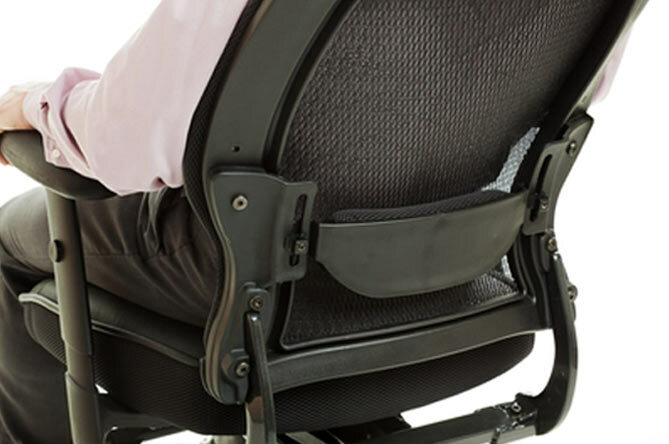 ver time, poor posture and back pain may be caused by everyday workplace activities such as sitting in an office chair and working at a computer. 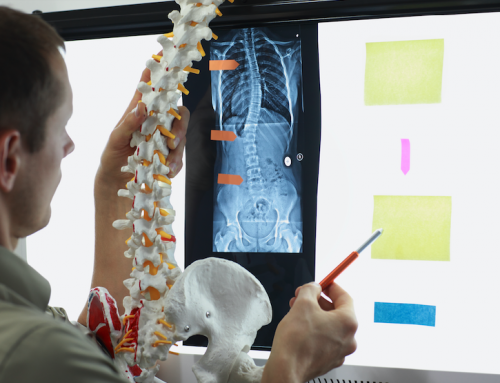 In an effort to prevent spinal damage, the ergonomics of the workplace are often examined. The goal of office ergonomics is to fit the job to the worker, not vice versa. It takes into account the physical stresses placed on joints, muscles, nerves, tendons, and bones. Do you sit at your computer more than four hours a day and have poor body mechanics? If so, you run the risk of developing a muscular skeletal disorder. It only takes a few simple adjustments to avoid injury. To achieve the ideal position, start by implementing the “90 degree rule”. Ideally, you want your knees bent at 90 degrees, hips at 90 degrees, and elbows at 90 degrees. Wrists should be neutral or straight. Footstools, sliding keyboard trays, sliding mouse trays or a back support cushion could be added to achieve these positions. Instead of buying expensive, specialized ergonomic equipment, improvise the old fashioned way. For example, if the desk is too low, use 2x4s to raise it. Align the monitor, keyboard, and chair in a straight line to avoid curving the spine. The mouse and document holder should be as close to the keyboard as possible to limit unnecessary eye and arm movements. Not only is proximity important, but how you hold your arms while working is key. Most importantly, take time to walk and stretch to break up repetitive movement or long periods of sitting. The key thing to take home is, if you spend more than four hours sitting, you have to interrupt that position at least every half hour for about ﬁve minutes. Just stand up, walk and stretch. It’s important to listen to the signals your body gives you. If you suffer pain after a long day of work, examine your work area and work practices to see if they may be causing the problems. Sometimes small modifications to work procedures, posture, habits, and/or work station design can make a big difference in the way you feel at the end of a day. If your pain persists, Dr. Kaster can relive discomfort with treatments, evaluate your workstation setup, and advise on proper body mechanics for your specific occupation. Contact us for an appointment today. Please bring photos and measurements of your workstation. Dr. Kaster is a trusted chiropractic physician in the Fort Myers & Naples areas. He treats auto accident injuries, back pain, headaches, etc., with nutrition and gentle, effective chiropractic care. Our licensed massage therapists are the finest in the industry, and they’ll customize massage techniques specifically to your needs for greater healing, pain relief and relaxation.